1. Put the oil in a large casserole dish/saucepan and put on a high heat. Add the bacon and cook until starting to crisp. 2. 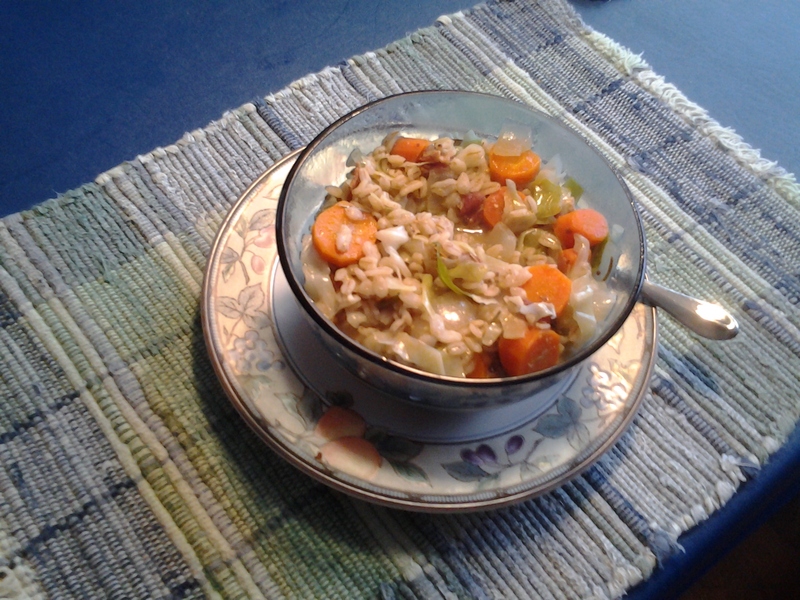 Add the sliced leeks and carrots and turn down the heat. Cook for 3 minutes, stirring often to make sure it doesn’t stick. 3. Add the chopped garlic and cook for a further 30 seconds. Add the pearl barley and mustard, stir. Let it simmer for a few seconds, then add the stock, rosemary, thyme and a little salt and pepper. Stir well, cover, and cook for another 10-15 minutes. 4. Taste the broth – add a little more seasoning or mustard if it needs and extra kick, then add the thinly sliced cabbage. Put the lid back on and cook for 5 more minutes. Enjoy!